The Nolan Company can help you improve financial performance in your Managed Medicaid business and ensure your members are receiving the benefits and services they are entitled to. In response to changing demographics and the Affordable Care Act, enrollment in Managed Medicaid is expected to increase from 70 million in 2014 to more than 90 million by 2020. This growth presents payers with new opportunities to expand membership and provide valuable benefits to an underserved and fast growing market. But realizing this growth requires an in-depth understanding of the unique challenges that Managed Medicaid presents. More importantly, it requires a willingness to embrace infrastructure changes that enable health plans to be far more responsive to key drivers of financial performance and more nimble than ever before in dealing with changes that impact financial performance. For health plans, the Managed Medicaid growth opportunity comes with increased regulation, new programs, and added oversight — factors that place significant stress on conventional management practices. To succeed in Managed Medicaid, health plans must build a management infrastructure that enables them — in near real-time — to monitor and adjust the key factors that drive financial performance. In Managed Medicaid, there are three key drivers for financial performance — Program Payments, Medical Expenses, and Administrative Costs. In order to respond quickly to factors that affect these drivers, health plans must have the capability to continuously monitor them, and have corresponding management practices that specify which actions to take as conditions change. The Nolan Company are experts in helping health plans meet these challenges. 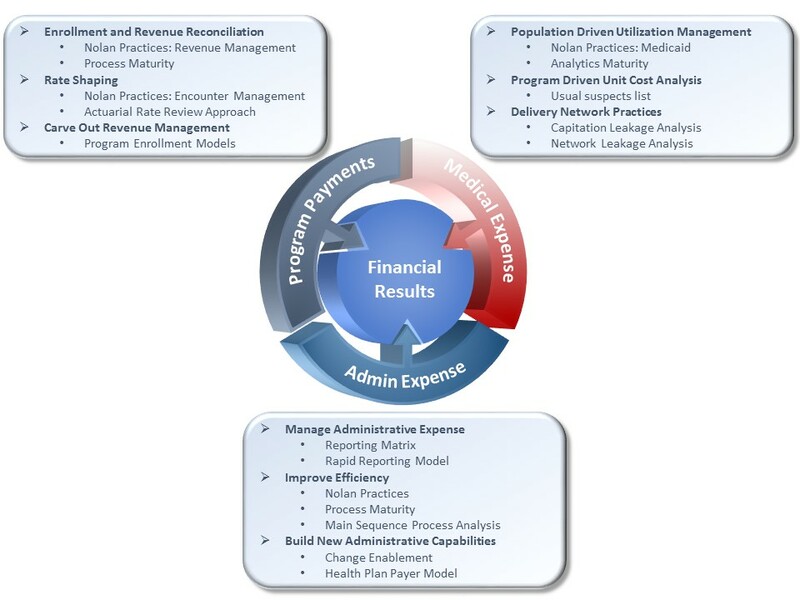 Through years of hands-on and observational experience in the evolving Medicaid environment, the Nolan team has designed a financial performance approach that defines the key drivers and typical levers that impact financial performance in Managed Medicaid. We have also developed tools to isolate the issues that require the most attention. Our approach defines the reporting and management capabilities you must have to monitor financial performance on an ongoing basis. And we quickly identify opportunities for improvement, so you can realize the results sooner. Using our Health Check approach, we first identify areas that can immediately impact financial performance, and we help you capture the corresponding benefits right away. We also determine if your members are receiving all of the services for which they are eligible. Then we help you establish the management capabilities that ensure financial performance is actively managed going forward. Near-term: Our financial performance approach and other analytics tools deliver a heat map and supporting analysis that pinpoints the specific levers that will impact your performance. Our analysis also identifies operational misalignment, and quantifies opportunities for improvement. Sustained Benefits: We define the operating environment that enables you to consistently monitor financial performance. We also implement the management practices that enable you to take action based on those financial performance analytics. Are program payments aligned with your membership? Are members receiving all of the benefits they are eligible for (e.g. SSI)? Is the State receiving and processing all of your encounter data? Is there network or capitation leakage? Are your unit costs in alignment with industry norms? Are there opportunities to reduce administrative expenses? What capabilities and organizational structure are needed to manage financial performance on an ongoing basis? Nolan’s model and approach helps payers focus on what’s important: making sure members receive the benefits and services they are eligible for, ensuring appropriate reimbursements, managing medical expenses, and driving operational efficiencies that can help improve overall financial performance. For over 40 years, The Nolan Company has helped businesses improve service, quality, productivity, and profitability through process innovation and effective use of technology. Nolan Consultants are seasoned healthcare industry professionals who have not only consulted on these issues — they’ve owned them. Nolan’s unique blend of tools, methods, and intellectual property sets us apart from other firms. We’re experts in developing operational and technology solutions that deliver immediate results and lasting outcomes — and we’re committed to working with you from assessment through implementation.